In Automator, there is a way to quickly convert an Action into its equivalent Applescript in Automator, I think by dragging it in some tricky way. I saw this some time ago but have now forgotten. I've tried searching and can't find it. In case anyone has this question, I found it, but it only works for recorded actions. After you Record some clicks or other actions in Automator, they appear in a "Watch Me Do" action. You can then click on and drag an individual action out of that Action and release when the + sign appears. Automator will add a "Run AppleScript" action with the AppleScript that sends the same clicks and key presses to System Events. 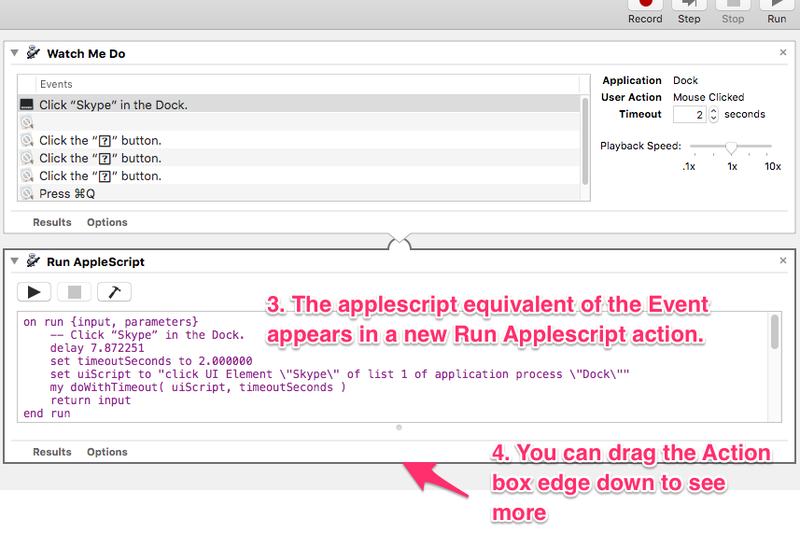 You can also simply Copy the action you want, switch over to AppleScript Editor, and paste to get the same code. -- Click “Skype” in the Dock. set uiScript to "click UI Element \"Skype\" of list 1 of application process \"Dock\""
run script "tell application \"System Events\"
It's impossible. You can do similar actions in applescript, but there is no way to convert an existing automator script to applescript. Create your Automator file as an "Application" type. Tell your AppleScript to run your Automator app. How can I find hidden items in Automator?